In the late 1800s, the soldiers of Fort Huachuca were in hot pursuit of Geronimo and defending settlers from Apache raids. During World War I, the 10th Cavalry “Buffalo Soldiers,” as the Cheyenne and Comanche referred to them, were assigned there to guard the U.S.-Mexico border and later followed Pancho Villa’s trail to Mexico. Today, Fort Huachuca is not only a national landmark brimming with stories of the Old West, it is home to the U.S. Army Intelligence Center and Network Enterprise Technology Command. Its protect-and-defend legacy lives on today in the thousands of soldiers stationed there whose chants echo across the Huachuca Mountains as they march across the grounds some 15 miles north of the Mexico border. While they support our country, it’s important the southwest desert post supports them. A reliable infrastructure system is a fundamental way of doing that. Earlier this year, work was completed on a modernized piping system for chilled and hot water. 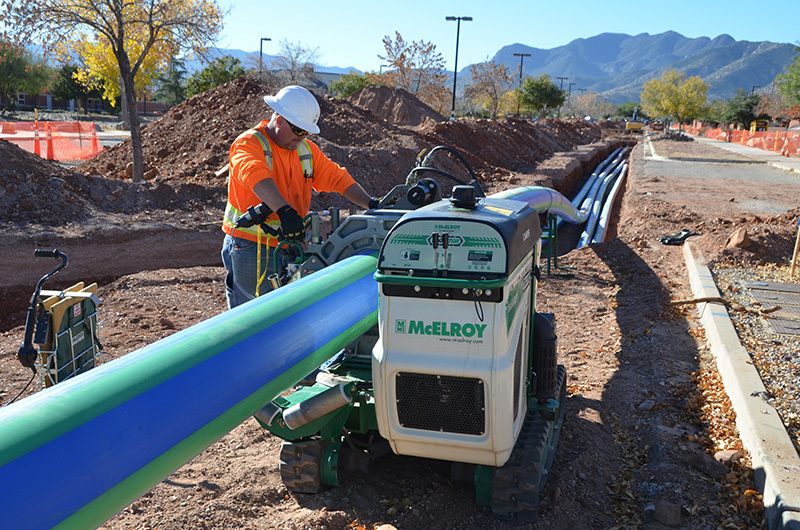 Aquatherm polypropylene-random (PP-R) pipe was selected as a long-term solution to replace a fiberglass system that had reached the end of its life cycle. Water is a precious resource in the arid climate, and Aquatherm’s leak-free system helps ensure that it is not wasted. It also has no rust issues and a life expectancy of more than 60 years. “The post wanted a product that would last a long time. 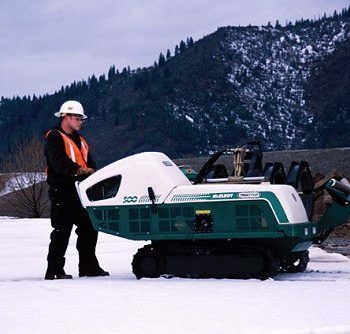 Aquatherm was obviously the right choice,” said Scott Harvey of Harvey Plumbing, a local sub-contractor on the job for SBBI, a federal infrastructure contractor. 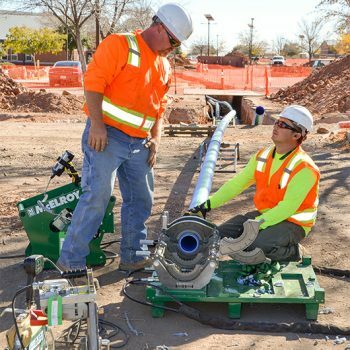 Aquatherm Blue Pipe® from 2″ all the way up to 14″ for the main line was installed in open trenches for chilled and hot water supply and return lines to buildings throughout the Fort. Altogether, nearly six miles of pipe was installed. Harvey was a relative newcomer to polypropylene pipe, having worked for years in the industry on traditional copper and steel plumbing systems. He was new to pipe fusion as well, which is the process that joins polypropylene pipe ends together using heat and pressure. The result is a seamless pipe system that greatly reduces the possibility of leaks and future maintenance costs. Harvey Plumbing rented fusion equipment from Ferguson, a Certified McElroy Rental supplier which also was able to provide certified training for the new fusion operators. 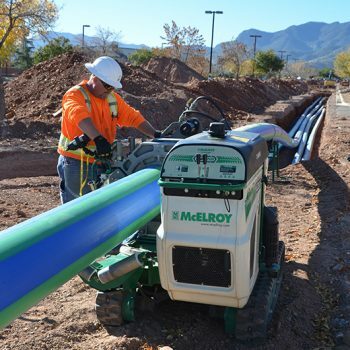 McElroy provided on-site technical support on the equipment which included a TracStar® 618, a Rolling 412 and an Acrobat™ 160 and consulted on jobsite setup. “Everyone who worked with the machines really liked them. Some guys that weren’t on the project in the beginning got to work with them at the end because they were so jealous of the ones working on it. We got more of them certified so they would have a chance to do it. 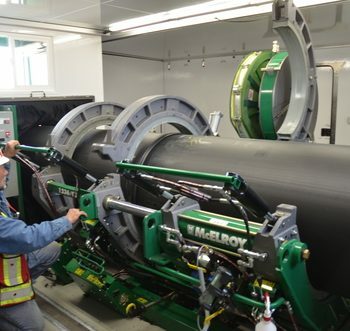 For the guys it’s a lot of fun anytime they can work with large pipe and fusion machines,” Harvey said. As with any job, there were challenges to work through. They had limited outdoor work space with many sidewalks, buildings, landscaping and open trenches to work around. It was also an active base so they needed to avoid interrupting the soldiers’ duties and continue to provide cooling and heating to all the barracks during construction. A pipe-handling, productivity tool known as the PolyHorse® helped in this effort. The crew could stock a day’s worth of pipe on the PolyHorses which fed into the fusion machines, allowing for continuous work flow. As a joint was being fused on one machine, another joint was cooling on another machine and then fed down the trench, and vice versa. Harvey said this process helped get the job done in time. They started the project in October 2015 and were able to finish up in May 2016. Harvey found the fusion machines to be very easy to work with and was struck by the speed in which joints can be fused. Harvey also found McElroy’s DataLogger® 5 to be well worth the investment. 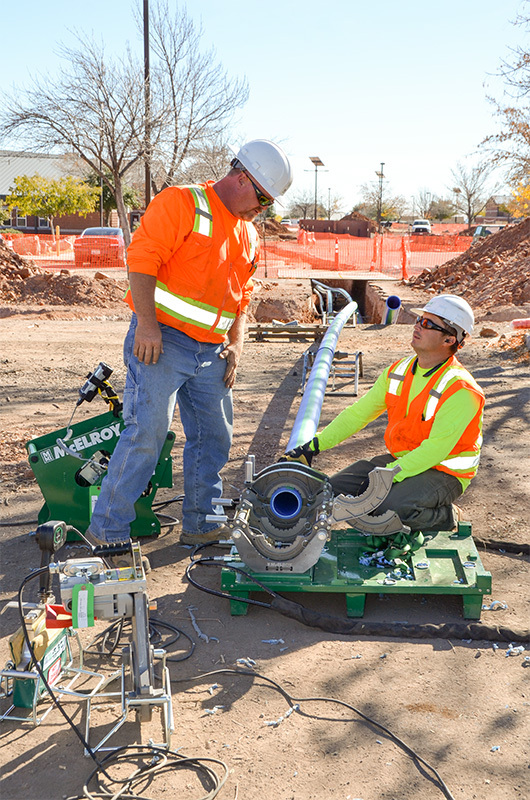 The hand-held device keeps a record of each fusion so that operators can check to see that the correct pressure, heating and cooling times were followed which verifies the quality of the joint before the pipe is buried. This can prevent costly repairs down the line. As it turned out, all of the fusions were good and there was not a single leak on a single joint.